This is one of my all time favorite recipes for fall; it’s quick, easy, and surprisingly healthy! 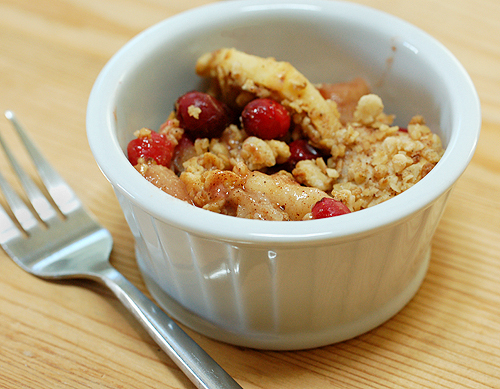 Aside from that, it’s delicious.. Sweet apples combined with tart cranberries, crunchy granola, and autumn spices make for a prefect introduction to fall. This is probably a serving size.. but, uh.. I probably eat two servings in a sitting. This post wouldn’t be complete without the recipe, of course! Top this comforting autumn crisp with a scoop of vanilla ice cream of a dollop of yogurt before serving, if you like. Preheat oven to 350°F. 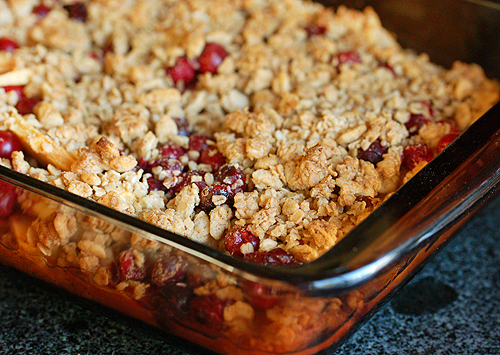 Combine apples and cranberries and pour into an 8- or 9-inch square baking dish. In a small bowl, whisk together apple juice, flour and pumpkin pie spice. Pour over the fruit. Sprinkle granola evenly over the fruit and lightly press down. Bake until hot and bubbly, 40 to 45 minutes. Serve warm, room temperature or cold. This entry was posted in Recipes and tagged apple, apple crisp, autumn, breakfast, brunch, cranberry, fall, pumpkin pie spice, recipe. Bookmark the permalink.